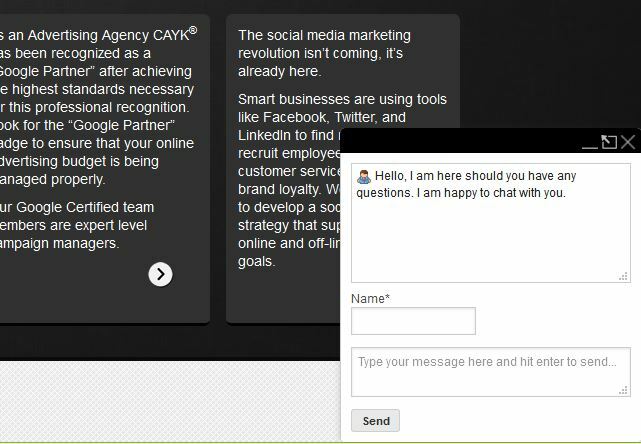 Moderated Live Chat - CAYK Marketing Inc.
Over the past months, we have been beta testing LiveHelp at a handful of websites. We are not just sitting quietly hoping a potential client will chat with us. We are pushing out an engaging ‘ping’ and alerting the visitors that we are here to help them! The results have been more than encouraging. The number of potential customers that are willing to chat with our operators is excellent. We are taking names, getting phone numbers and booking appointments! Does it work? 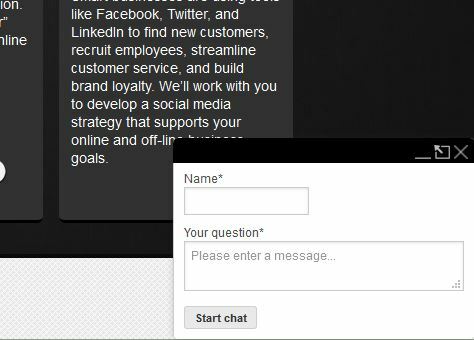 Do website visitors want to chat? Yes, absolutely! Engaged visitors who are in their moment of need love the ability to quickly get their issue resolved. Potential dental patients ask, “do you do general dentistry and are you accepting new patients?” Our client who repairs BMW’s was asked, “can you update the computer module on my 2005…”, and we are engaging potential customers on a daily basis for our business as well as several client beta accounts. These two examples are typical of the types of chats our team are having with potential customers on behalf of our clients! Do People like Live Chat? There are a number of compelling studies that support the provision of LiveHelp at a marketing website. The Lead Response Management Organization states, “the bottom line – responding to web-generated leads within five minutes = 900% increase in contact rate.” So why not engage while the person is still at the website? According to eDigital’s Customer Service Benchmark, Live chat has the highest satisfaction levels for any customer service channel, with 73%, compared to 61% for email and 44% for telephone. They surveyed 2,000 consumers on their experiences of various customer service channels. We Monitor & Engage – but you can too! We are developing this service because we want our marketing clients to have every opportunity to convert the visitors to their website into potential clients – and this is one way of adding value to our overall approach to digital marketing. Our team will monitor and engage site visitors Monday to Friday 8:30am to 5pm. As an option, you or your designate can also login and monitor your own website visitors. Ready to Learn More & Get Pricing? Chat with us now or Call Calgary; and speak to a Calgary advisor today. Alternatively, shoot us a note from the form on this page, and we will respond… very quickly!